I can’t make out the charm hanging on Miso Kovac’s gold chain but I imagine it would be something as repulsive as the Italian horn. There were days when dudes actually dressed like this. And guess what? Them days is coming back! Gold has never been out style since they invented it. Giant sunglasses with wide sides are back. Hairstyles are regressing back to the seventies says a hair stylist friend. And you know, a kiss without a moustache is not a kiss. Of course, my prejudice tells me that most men wearing tank tops are gangbangers. Yet, I always think of Marlon Brando when there is a tank top around. Miso Kovac is like a Brando with a heart of gold. Unspoiled. Miso comes from Dalmatia. No, it’s not a dog or anything like that. Dalmatia is a coastal region of Croatia. Hence the sailor shirt he’s wearing. I don’t remember his tunes well other than they were bombastic. They were a combination of Mediterranean easy listening, Tyrolean folk and Mexican norteñas – all with lots of reverb. 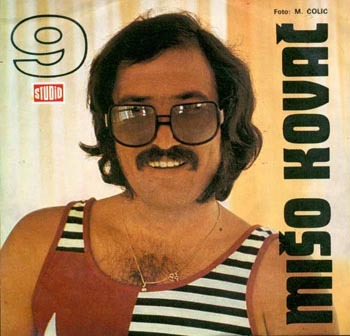 This entry was posted in Records and tagged Bad record covers, croatia, dalmatia, miso kovac. Bookmark the permalink. 8 Responses to "A Single Dalmatian"
ILI STE TAKVI DOK TRAJA TRAJE n.b. miso budi jak saljem ti moju ljubav i da te dragi bog blagoslovi i cuva i neka te prate njegovi andjeli n.b. volim te I tvoje pjesme kad tebe slusam moj zivot je komplet love you n.b. sretan ti rodjendan i da pozivis jos mnogo mnogo godina vidt love N.B. bilo je to jedno davno ljeto rana jesen jedna topla Zima sreo si se jedmom zenom plave kose koja sada malog misu ima prekrasna pjesma zena plave kose koja jos uvjek ljubav za tebe ima love you n.b.